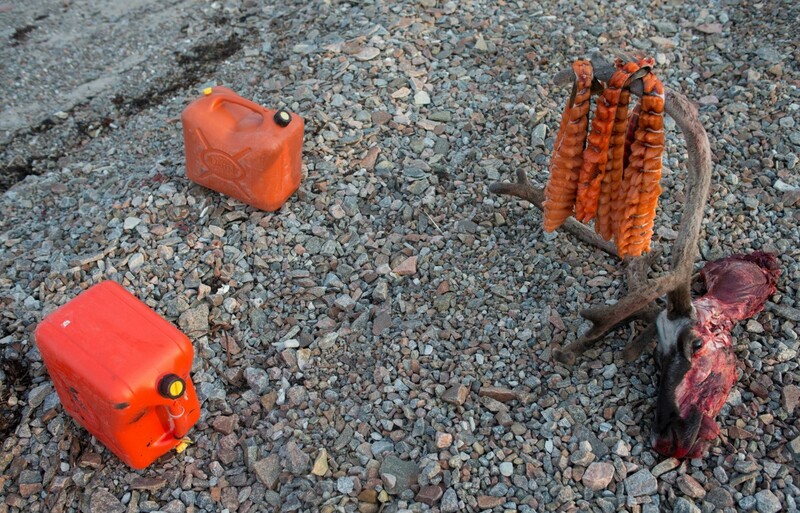 Jerry cans with fuel and a caribou head with Arctic Char drying on its antlers seen at a base camp for Canadian Rangers Type 1 Patrol North of the Inuit Hamlet of Naujaat, Nunavut. (Credit Image: © Louie Palu for National Geographic), Louie Palu’s work was supported by funding from the John Simon Guggenheim Memorial Foundation, National Geographic Magazine and Pulitzer Center. April 11, 2019, Kleinburg, ON – The McMichael Canadian Art Collection is pleased to announce that it will partner with the Scotiabank CONTACT Photography Festival, the world’s largest photography event, for the sixth consecutive year. The McMichael will present the exhibition Louie Palu: Distant Early Warning, featuring the work of award-winning Canadian photographer Louie Palu (b. 1968, Toronto.) The exhibition opens May 18 and remains on view until September 2, 2019. Louie Palu’s project documents the vestigial legacies of the Cold War and the increased military presence in the Arctic today. The changes in the region are exacerbated by the many unknowns the Arctic faces, among them the warming of the planet. Over several years — from 2015 to 2018 — what began as a Guggenheim Fellowship evolved into an assignment for National Geographic Magazine. Taken as a whole, the series of photographs examines the growing geopolitical tensions and changing life around Inuit communities in one of the planet’s most extreme and challenging places. As a documentary photographer and filmmaker whose work has examined socio-political issues for nearly three decades, Palu is an experienced documentarian of numerous conflicts around the world, including Afghanistan, Pakistan, Mexico and Ukraine. His work has been displayed in collections around the world and has been featured in numerous prestigious publications. Louie Palu’s work was supported by funding from the John Simon Guggenheim Memorial Foundation, National Geographic Magazine and Pulitzer Center. This exhibition is part of the Scotiabank CONTACT Photography Festival and is sponsored by Blake Goldring and Canada Company: Many Ways to Serve. Louie Palu is a documentary photographer and filmmaker whose work has examined socio-political issues such as human rights and war for 27 years. He is a Guggenheim Foundation Fellow and Harry Ransom Center Research Fellow. He has covered conflict in Afghanistan, Pakistan, Mexico and Ukraine. His work is held in numerous collections including the National Gallery of Art and Museum of Fine Arts Boston. His work has been published worldwide and has been featured on the BBC, and in Der Spiegel, El Pais, La Republica and The New York Times. His photographs and films have been exhibited in numerous museums and festivals including at the Smithsonian National Portrait Gallery and Munich Documentary Film Festival. Media wishing to speak with exhibition curator Sarah Milroy, view the exhibition, or request high-resolution images of the artworks may contact Sam Cheung at scheung@mcmichael.com or 905.893.1121 ext. 2210. Members of the media are invited to a media preview of the exhibition on the evening of May 21 at 5:30 pm. Artist Louie Palu and Chief Curator Sarah Milroy will be available for questions regarding the exhibition throughout the evening. Light refreshments will be served. Media members attending the preview will receive complimentary parking and admission to the artist-led exhibition opening tour. For more information or to register, please contact Sam Cheung at scheung@mcmichael.com or 905.893.1121 ext. 2210. Opening on June 1, the exhibition Itee Pootoogook: Hymns to the Silence will present an additional perspective on life in the Arctic, the McMichael’s geographic focus for the season. Curated by Nancy Campbell, the retrospective of over 80 drawings and ephemera by Itee Pootoogook (1951–2014) will be the largest exhibition of his work to date and forms part of an ongoing analysis of the careers of contemporary Inuit trailblazers. Hymns to the Silence will provide a personal, differing perspective on the issues that face contemporary Inuit communities. Louie Palu will lead a tour of his most recent photographic project in the Arctic. For the last three years, on assignment with National Geographic, Palu has investigated the vestigial legacies of the Cold War and current military activities in this extreme northern environment. For details and to register, please visit our website. This discussion panel is a unique opportunity to discover more about the exhibition Louie Palu: Distant Early Warning, a photography project documenting the geopolitical change resulting from the effects of global warming against the background of an austere and forbidding landscape. Moderated by McMichael Chief Curator Sarah Milroy, the panel will include artist Louie Palu, Tarrilik Duffy and Sadie Quarrier, Senior Photo Editor from National Geographic and photo editor on the project. One of the key members of the third-generation of Inuit artists from Kinngait (Cape Dorset), Itee Pootoogook contributed to the transformation and reshaping of the creative traditions that were successfully pioneered in the second half of the 20th century by members of the West Baffin Eskimo Cooperative at Kinngait Studios. This presentation by exhibition curator Nancy Campbell will position his career in relation to other Inuit art innovators. Registration required. Coffee and refreshments will be served from 3 to 3:30 pm in the Founders’ Lounge. CONTACT, a not-for-profit organization founded in 1997, is generously supported by Scotiabank, Scotia Wealth Management, Nikon Canada, Pattison Outdoor Advertising, Toronto Image Works, Transcontinental PLM, 3M Canada, BIG Digital, Waddington’s Auctioneers and Appraisers, Four By Eight Signs, Beyond Digital Imaging, Steam Whistle Brewing, Art Toronto, The Gladstone Hotel, The Globe and Mail, The Metropolitan Detroit, NOW Magazine, CBC Toronto, and Canadian Art.